This letting agreement is for a property that has a commercial kitchen. Most commonly, this lease would be used for a restaurant, cafe, delicatessen or fast food outlet. The lease allows for the property to have space used for other business purposes as well. Features: short term: 1 to 5 years; guarantor; break provision; rent review options; option for assignment; sub-letting not allowed; draft agreement for security deposit; schedule covering kitchen and cooking equipment. This agreement should be used to let a food retail unit such as a restaurant, cafe, delicatessen, or fast food outlet. It may be part of a parade of other shops owned by other landlords, or it may be stand-alone. Of importance, since there are no service charge recovery provisions, is that the restaurant should not share services or facilities with neighbouring units. The restaurant or cafe may have additional space used by the tenant for other business purposes, such as offices or storage. This lease does not cover additional space used for residential use by the tenant, although Net Lawman does provide one that does (see below). 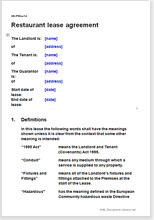 The document has been drawn to help protect the landlord's interests as greatly as possible. If the property will be used as a standard shop, use Shop lease agreement or Business lease: shop in parade. The latter contains service charge recovery provisions. If the tenant will also live at the property, use Mixed use lease: shop in parade with residential space. This document has been drawn so as to make it applicable to the vast majority of leasing scenarios for restaurants and cafes without making it difficult to edit. This restaurant lease is comprehensive, providing alternative choices for important decisions. "Efficient & fast way to create legal docs. "